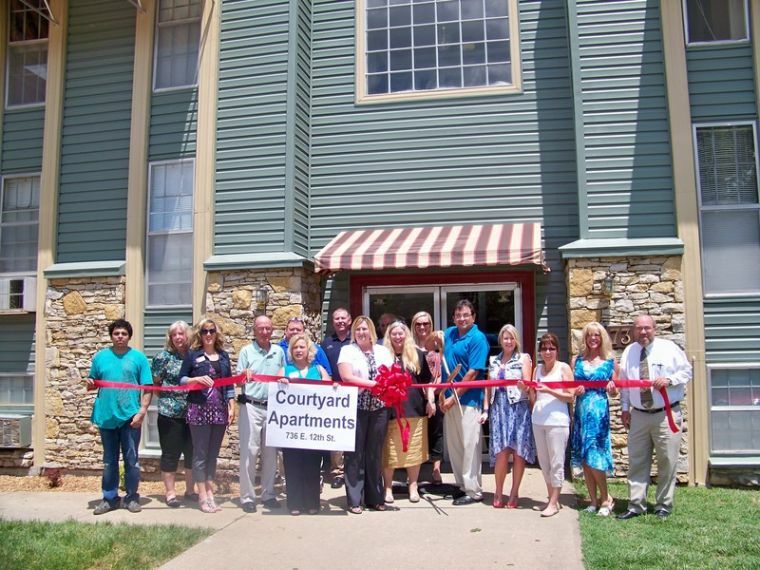 On May 28 a Ribbon Cutting was held in celebration of all the many new changes at Courtyard Apartments, 736 E. 12th St.Learn more about the Courtyard Apartments at courtyardapartments-emporia.com. 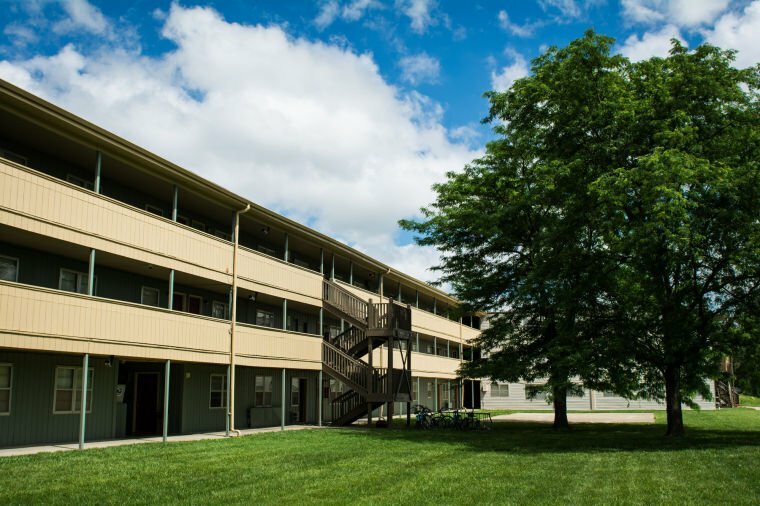 Apartment living on the East side of Emporia received a boost recently when the complex at 736 East 12th Ave. came under new ownership. Rechristened Courtyard Apartments (formerly Cambridge Apartments), the complex was purchased by Burlingame Property Management in March 2014, the new owners immediately went to work updating and refreshing the building. The 80-unit property, built in 1965, had become rundown under the previous owner and was in need of significant upgrades to bring it to the standard Sanchez requires. Improvements include new carpet, paint and appliances in most units; replacing doors and windows; and a facelift for the exterior including new siding and striped awnings for increased curb appeal. The courtyard from which the complex derives its name has also been refreshed. In addition to the physical upgrades, Sanchez and his team overhauled the maintenance system to better serve residents. Sanchez said that while the project may seem huge to the community watching the renovations, improving the community is business as usual for him. A sense of community seems to permeate Sanchez’s enterprise. He and his wife live in Colorado and own properties in several states, but his overwhelmingly positive experience in Emporia has him taking a second look at the city. “Emporia is one of the friendliest towns I’ve ever been in,” he said. Sanchez employed local contractors and purchased many of the supplies for the renovation project locally, spent many lunch breaks at local restaurants – Casa Ramos is a favorite – and is already looking at purchasing additional property in Emporia. Community support, led by the institution who financed the Courtyard Apartments project, is a large factor in his desire to invest more in Emporia. Sanchez’s vision for Courtyard Apartments is to remain the most affordable units in town, but “with a bit of an uplift.” He plans to keep rents as close to the previous rates as before, while maintaining a safe, clean living environment. On May 28th the new owners and staff were joined by the Emporia Chamber of Commerce, representatives from CoreFirst Bank and several other community leaders, including city commissioner, police chief, Emporia Gazette, Value Net and M&N Carpet representatives, for a ribbon cutting ceremony to officially introduce Emporia to the new and improved Courtyard Apartments. Property managers, Kim Fladung and Vivian Steavenson, are available to provide tours and further information about the apartments. They can be reached at 620-757-2300 or via email at admin@cyapts.co. Visit them online at courtyardapartments-emporia.com.